Anyway, because you're still reading, I'm going to assume you are in the 'I like parsnips' camp (officially titled Camparsnip and coming soon to a field near you). Whilst parsnips are delicious simply roasted with olive oil, their earthiness pairs extremely well with Winter-Soup-Usual-Suspects carrot, celery, leek, thyme and bay leaves. Parsnips' inherent sweetness is enhanced by a dash of something creamy and sweet; I've gone for soya cream here - a recent and delicious discovery. All that remains is a garnish. I like to add a contrasting crunch to soup, for example, croutons or slivered almonds, but my go-to is quickly toasted, golden-brown pumpkin and sunflower seeds. Heat the oil in a casserole dish or large saucepan over a medium-high heat. Fry the carrot, leek and celery for 10 minutes, stirring occasionally. Add the thyme and bay leaves and cook for 5 more minutes. Add the parsnips, plant-based milk and 1 litre/4 cups water. Bring to a boil, then reduce the heat down to a simmer, cover and cook for 45 minutes. Stir in the salt, pepper and soya cream (if using). Transfer everything to a blender and blitz to a smooth, creamy soup. This could be done with a stick blender in the saucepan but will take a long time to achieve a smooth consistency. Heat a small frying pan over a medium-high heat. Toast the seeds for 5-6 minutes, shaking occasionally, until golden brown and aromatic. Add a little water to the soup if it's too thick. 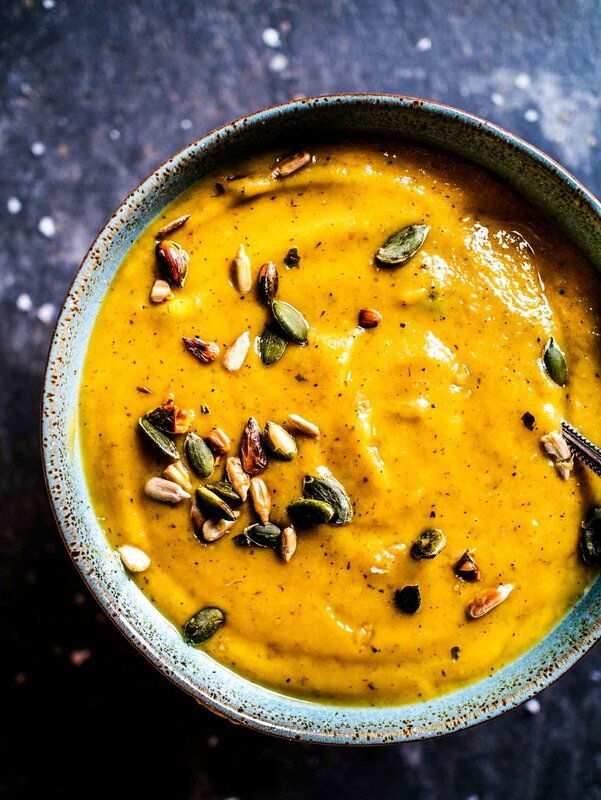 Serve into bowls topped with an extra splash of soya cream, a good grind of black pepper and some toasted pumpkins and sunflower seeds. 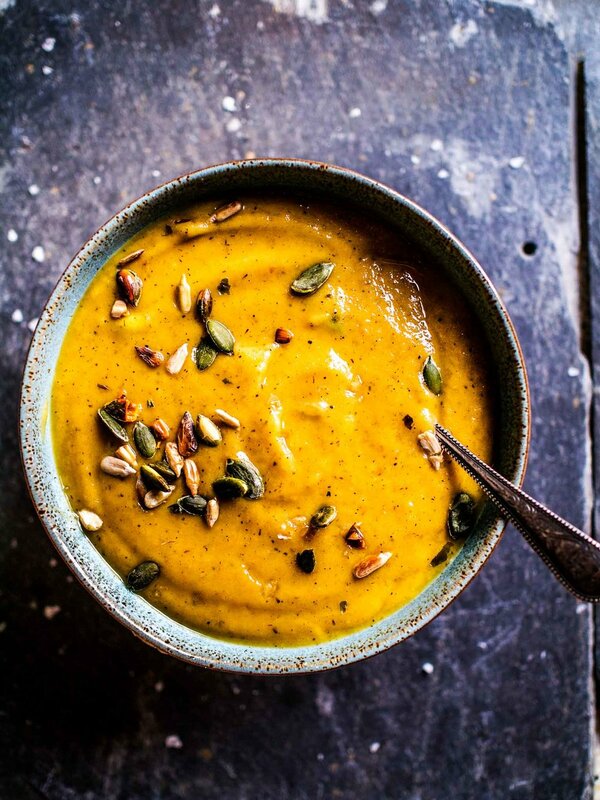 Creamy Winter Parsnip Soup Recipe w/ toasted pumpkin & sunflower seeds.